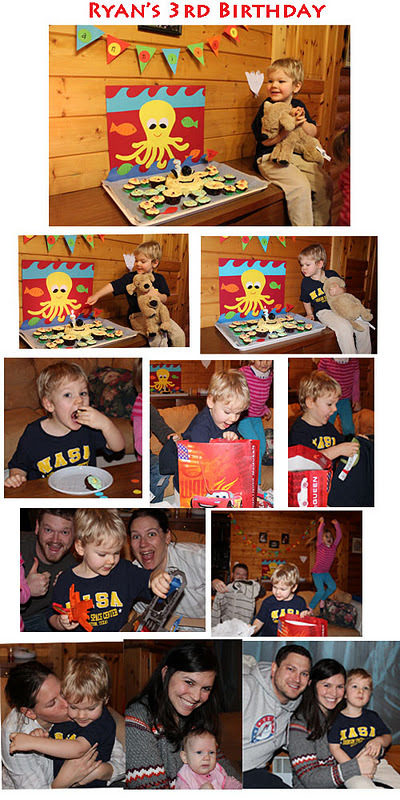 Bonjour, Y'all: Ryan turns 3! Ryan turned 3 today! We gained inspiration for our party theme from Ryan's pronunciation of OCTOPUS... aka "HAWKAPUS." We had a flag banner, big octopus card, and attempted to make an octopus cake complete with cupcake tentacles. If you would have seen how it started out, you would realize what a BIG accomplishment this was! :) At the last minute, I decided to add some blue paper waves and fish because I wanted to make sure it looked more like an octopus and less like a sunshine. The little banner he is holding says "Happy 3rd Birthday!" I thought it was a cute touch. Ryan had a BLAST! He was the happiest kid, loved singing and blowing out his candles, and opened lots of gifts including some cute little boy clothes, finger paints, a book, and ... HOT WHEELS!!! He was beside himself about the hot wheels. He really is turning into a little boy right before our eyes, its crazy. Please look closely at the 2nd to last row of the photo collage and see the money shot of Sophia celebrating :) Pretty awesome! Happy 3rd Birthday to my adorable nephew Ryan! Happy birthday to Ryan!! Wish I was there to celebrate!! The cake DOES look like an octopus, not a sun. Good job!